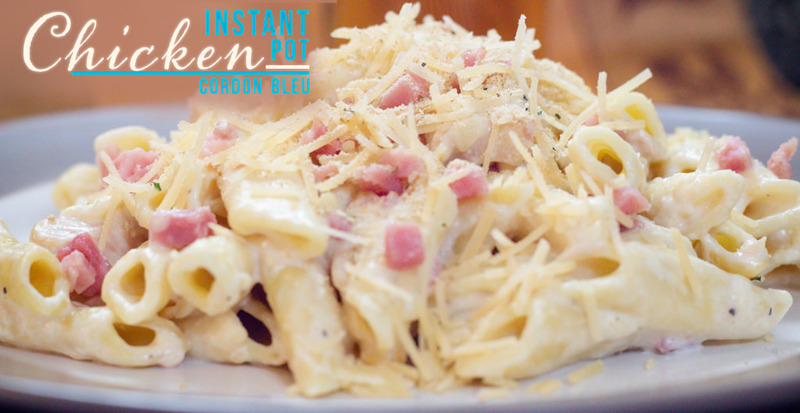 Chicken Cordon Blue Casserole is a Kid Approved Recipe! In fact, it’s my picky eaters FAVORITE recipe! Chicken Cordon Bleu Casserole received a 9.5 Star ranking from my son who went back for seconds and told his dad he better hurry and eat before it’s gone. 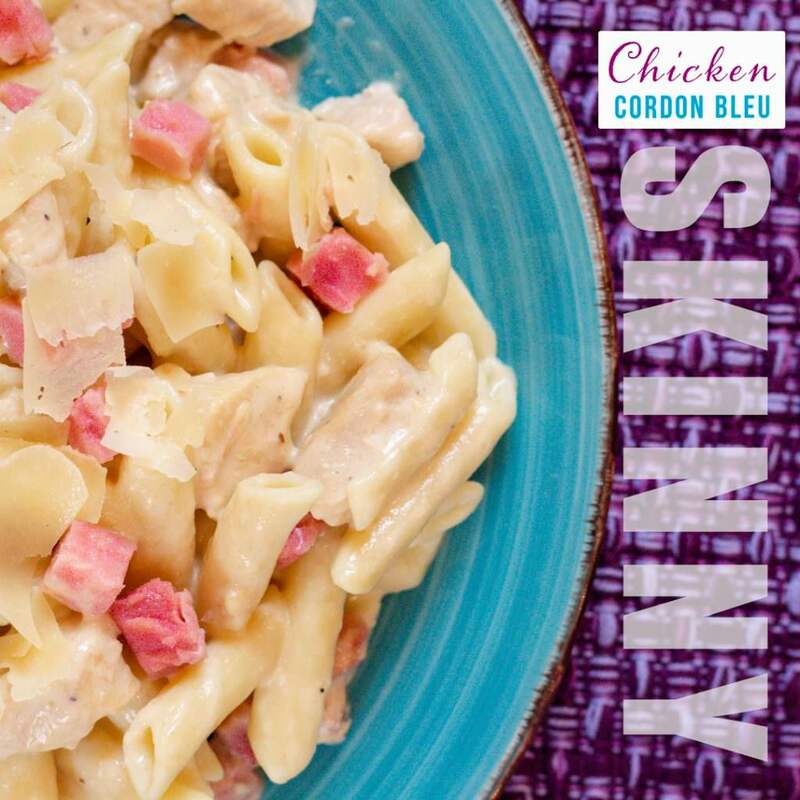 With all the traditional flavors you would expect from Chicken Cordon Blue, this Casserole is a family favorite. Making meals my family will eat is a high priority, finding a recipe my picky eater son will devour is another and when I do, I make a huge point to share with others hoping other picky eaters will love it too! 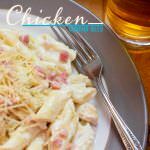 This is definitely one of those recipes as Chicken Cordon Bleu Casserole is made so easily and has all the ingredients kids love. Traditionally Chicken Cordon Bleu is a chicken breast stuffed with ham and Swiss cheese, breaded and baked in a wonderful sauce. It’s delicious. 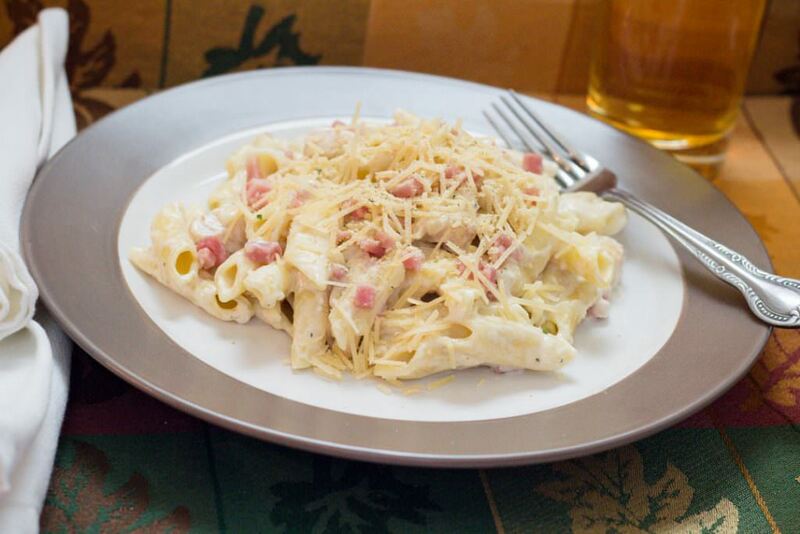 This fun twist to Chicken Cordon Bleu has all the same elements deconstructed and with pasta. As an option, you can serve Cordon Bleu with crushed Ritz crackers sprinkled on top for the added texture and flavor. And it’s even better if you mix 2 tubes of Crushed Ritz Crackers with 1/2 cup melted butter before adding to your Chicken Cordon Bleu. I talk a lot about “my picky eater son”, haha… he is particular in what he eats but will actually eat a lot of things. He just needs to know it has “normal” ingredients without ingredients hidden in them. Like veggies! However, if he is unsure, he won’t even try a meal. So finding recipes that he goes back for seconds for is something we love and as adults appreciate the flavors is a bonus in my world. I had a huge request to make this recipe for Chicken Cordon Blue Casserole with less fat and sodium. 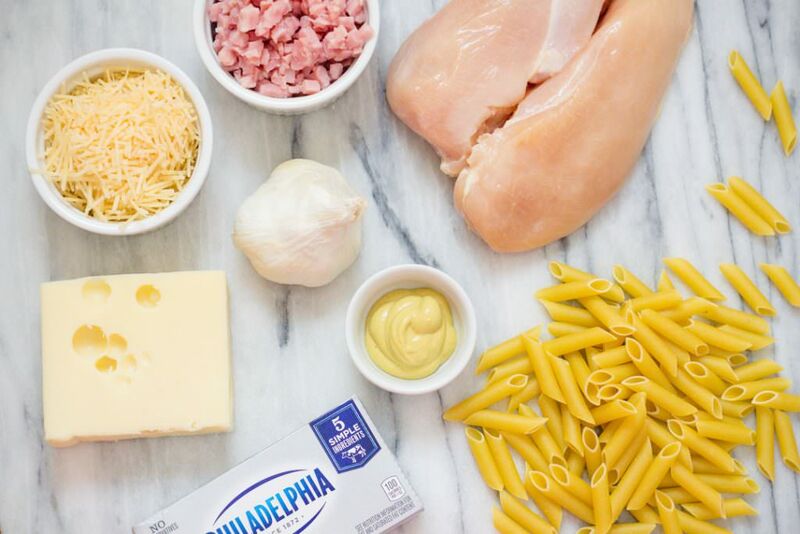 Get the Skinny on this Skinny Chicken Cordon Bleu Recipe. 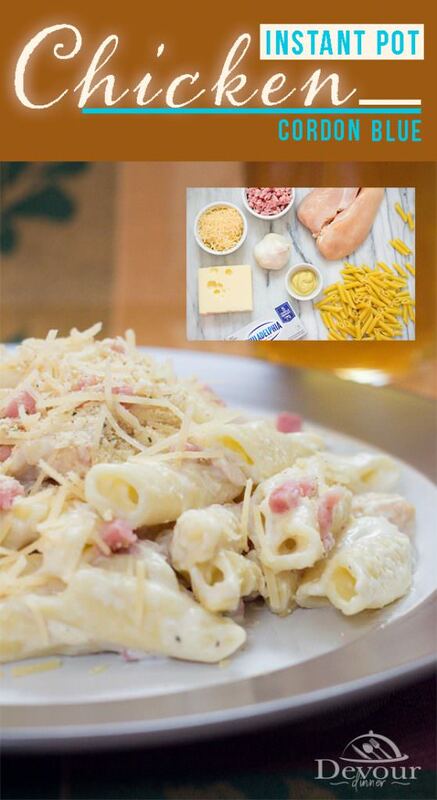 Lose the fat but not all the flavors you want from a Chicken Cordon Bleu Recipe. And you just might be amazed what my picky eater son ranked this recipe. Go take a look and decide for yourself which recipe you prefer. 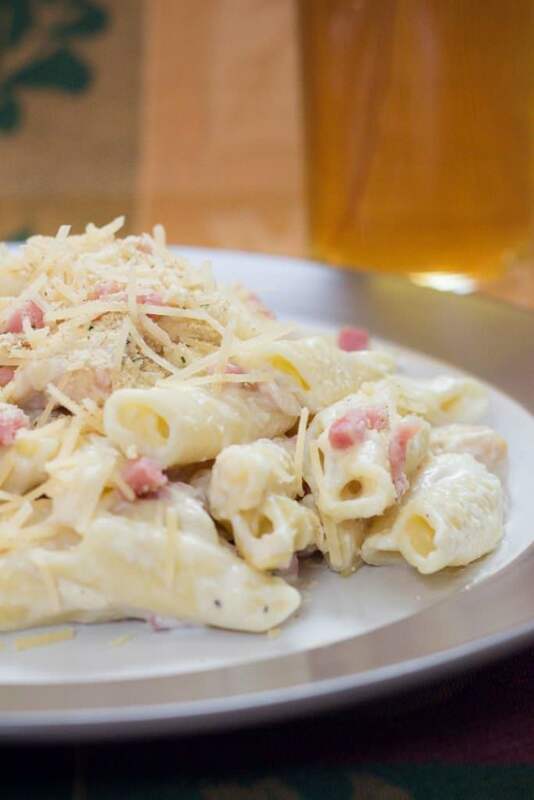 Chicken Cordon Blue with pasta is one of those recipes that our family enjoys. I love the flavor and will even add a little extra dijon if I think I can get away with it from the kids. 😉 What they don’t know won’t hurt them, right? Can I make Chicken Cordon Bleu Casserole on the Stove? Yes! This recipe is an Instant Pot recipe, however we have included the needed directions for stove top on the recipe card below. Please note that some of the ingredient measurements are adjusted because of the difference. 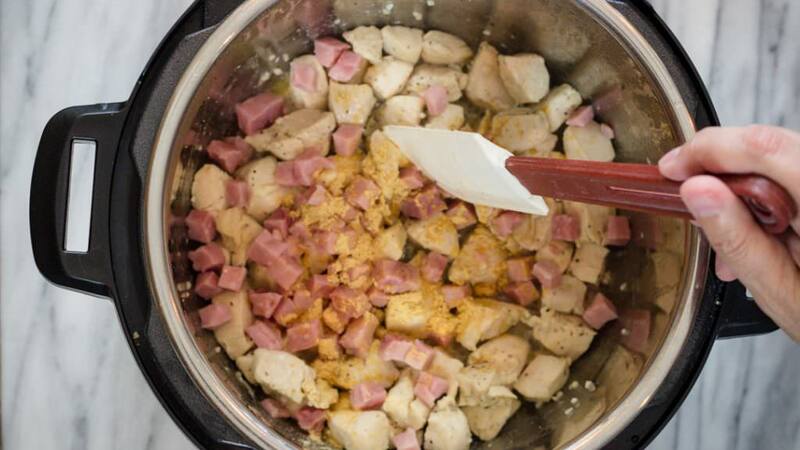 Does Chicken Cordon Bleu Casserole really only take 6 minutes in the Instant Pot? Yes! And Actually depending on how done you like your noodles and the type of noodles you are using it can take less. I find that Bowtie and Shells seem to need longer (by a minute). As you use your Instant Pot, you will find the time that works for your liking. But 6 minutes seems to be a good standard. Can I add the Cream Cheese after the cooking time for the Instant Pot? Yes! You can. Make sure it’s sat out on the counter for a minute to not be as hard and it will easily melt into the hot pasta from the Instant Pot after the cook time. Is the Chicken fully cooked? 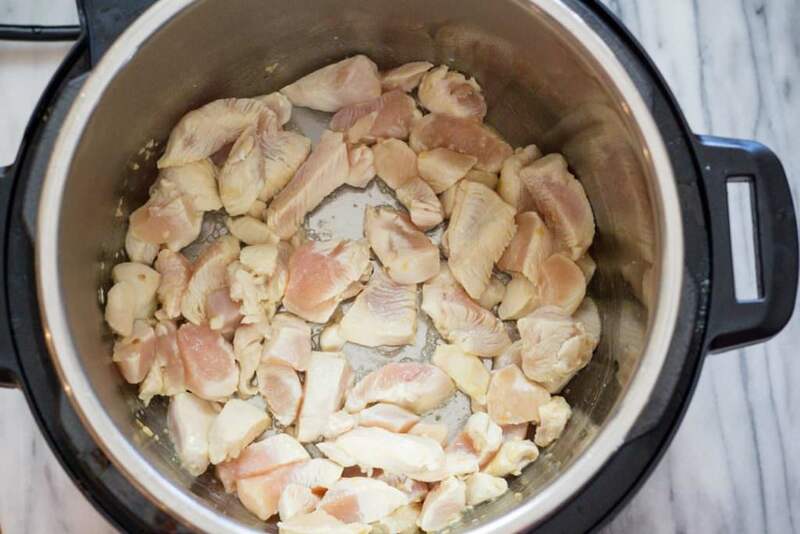 In this recipe with the Instant Pot instructions you have cooked the chicken on Saute’ until you no longer see pink and then the chicken has cooked for 6 minutes under pressure. If you are in doubt check the internal temperature that the chicken has reached 165 degrees. 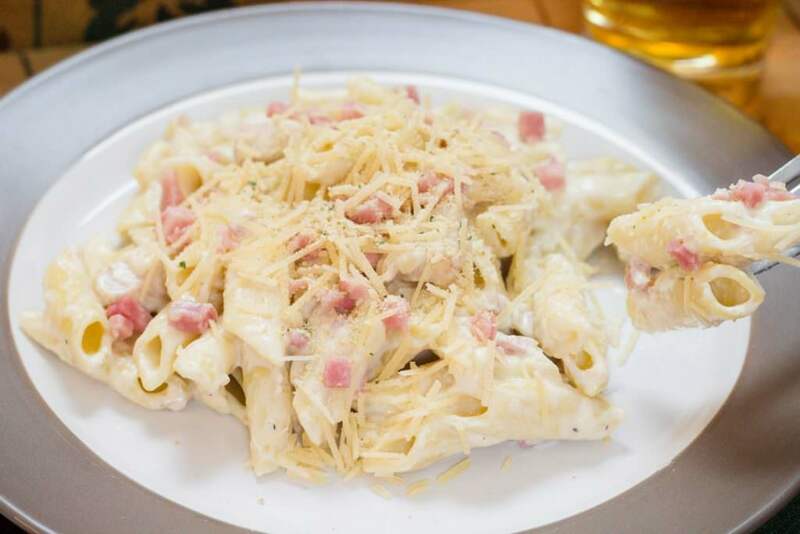 What can I serve with Chicken Cordon Bleu Casserole? This is really a one pot meal. However you can always add a steamed vegetable or a beautiful salad on the side to compliment this meal. Melt Butter and add garlic to Instant Pot. Saute’ cubed chicken in Instant Pot until no longer pink. Add Salt and Pepper, & Dijon Mustard and Ham and heat through quickly. Turn off Instant Pot. Serve and enjoy your deconstructed Chicken Cordon Blue! This recipe needs time to cool for the sauce to thicken, otherwise the sauce is very thin. But thick or thin, the sauce is wonderful! Chicken Cordon Bleu made easy with the Instant Pot and stove top directions. Stuffed with Ham and Cheese and a delicious sauce will have even your little ones coming back for more. Set Instant Pot to Saute’ and allow to get Hot. Add Butter and Garlic. Add cubed chicken and cook until no longer pink. Add Salt and Pepper. Press Cancel on Instant Pot. Add ham cubes. I use the packaged diced ham chunks. Add broth, whipping cream, and water. Stir to combine. Add Pasta and make sure all is covered. Place Cream Cheese on top. Do not stir. Quick Release and open lid. 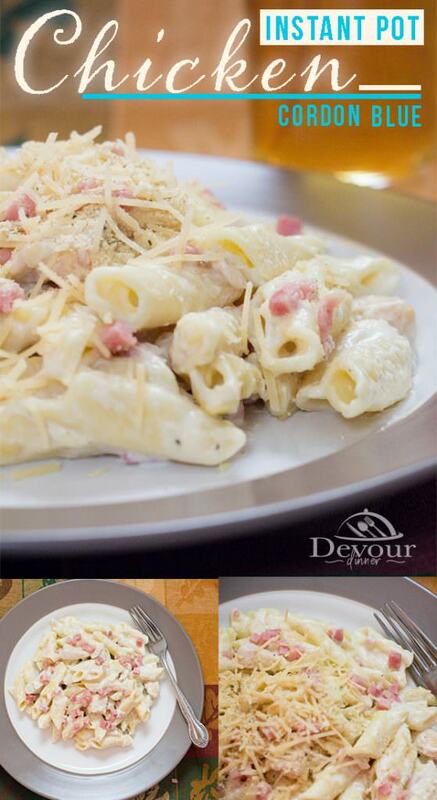 Stir to break up pasta and stir in Cream Cheese. Add Parmesan Cheese and Swiss Cheese. Stir. Cover and allow to sit for 10 mins for sauce to thicken. Optional. *Sprinkle crushed Ritz crackers on top before serving. In a frying pan over medium/high heat melt butter, add garlic. Then add cubed chicken and cook until chicken reaches 165 degrees. Add salt and Pepper and ham cubes. Heat through and remove from heat. Sauce: Heat 2 cups whipping cream and 2 cup broth. Add Cream Cheese and allow to melt. Add Dijon Mustard. Then add parmesan cheese and Swiss cheese. Stir to melt. Add salt and pepper to taste. Add sauce to Pasta and Chicken Mixture. Stir to combine. Sauce will thicken as it cools. Optional * Sprinkle crushed Ritz crackers on top before serving. Oh this is a HUGE hit with my teen! He takes it as leftovers for school lunch. Winner recipe in our book too! Can I somehow do this with frozen chicken tenders? You sure can! Chicken Tenders can be used, just throw them in on top of the pasta. They cook in about 6 mins which works well with the pasta. Follow the rest of the directions! This sounds so delicious!! Any chance there is a recipe for a slow cooker/crock pot? Hi Lois, you have a great question. Unfortunately the nature of the Crock Pot would have some limitations for this recipe. Noodles would be extremely mushy if cooked the length of time needed in a traditional recipe. I do include stove top directions please note that some of the ingredient measurements are adjusted. I hope this helps. Happy Cooking! I did not see your Skinny Cordon Bleu post until Sunday when I was planning the regular one. I omitted the cream cheese, used 1 whole cup of grated Swiss, used only 1 tsp of mustard, and did not add the cup of whipping cream till after cooking for 5 minutes, as I like my pasta al dente. Perfect results.. Family took helping after helping, 17 year old granddaughter saying it might be her new favorite recipe. Grandson was the only member of his team to qualify for State Charter School 5K on Saturday. planning a trip to Wimberley, Texas, for that ! 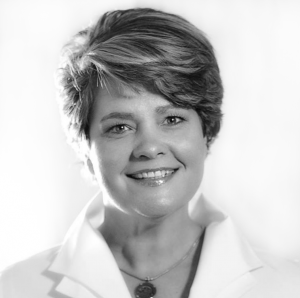 Lynn that is so great to hear!… This is a favorite of ours for sure. Tell your grandson Congrats qualifying for State Charter School 5k! That’s legit! And wish him good Luck on his race for sure! If I half the recipe, should I cut down the pressure time? No. The pressure time would stay the same. You would only change the pressure time if you want a more chewy noodle as opposed to a softer noodle. Thank you for your response. I was guessing it was the same since the ingredients increased. I increased the servings to 6 as I have adult kids. I have a 8qt Instant Pot. How did this work for you? 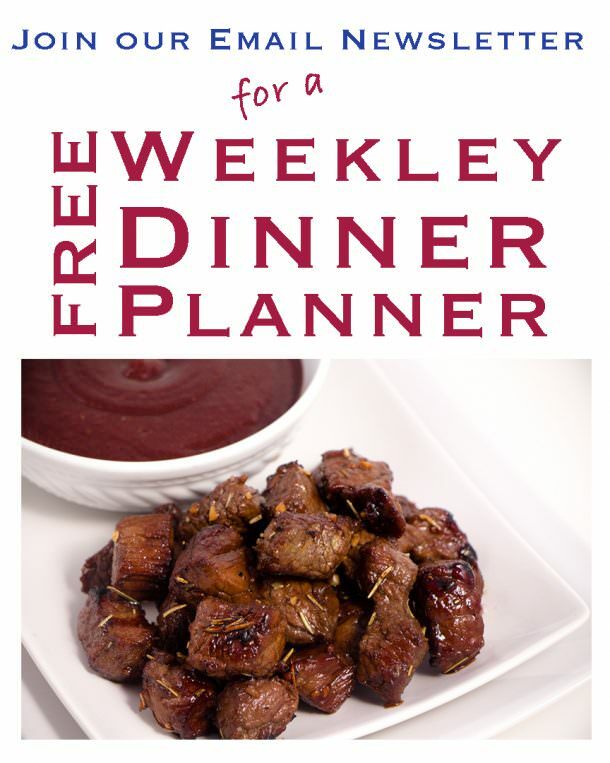 I am doubling the recipe for a work party and need to know what to set the cook time to? The cook time would be the same. It may take a little longer for your pot to come to pressure. I hope everyone loves it! After I hit 6 mins, is this including the time to let the pot build the pressure?? Or do I interrupt it after timing 6 mins and stir? The time to pressure is not included in the cook time. Set your Instant Pot to 6 minutes. The timer will start after it is pressured up. Hope this helps!! Enjoy! Thank you! One more question, I making this dish for a work party. If I double the recipe, I’m assuming I also double the cook time from six to twelve minutes? Is this correct? Has anyone tried? I have a Cordon Bleu recipe I was going to try , but not for the Instant Pot. I will do this one. My grandson, in the ninth grade, runs X-C too. The meets are so exciting. Cross Country is fun to watch and fun to see them improve on their own times! My son loves this recipe with all the carbs and cream. He burns so many calories a day he needs a lot of goodness. Wish your grandson good luck! Joseph runs 7 days a week; loves it. That’s great! My boy runs 5 days a week and then does a big bike ride or something different to get cardio in. It’s great! In what State are you? We are in Texas. I plan to make your recipe for Sunday after Church lunch.